InstallerParts flat Cat6 patch cables are designed to maximize flexibility without sacraficing performance. The thickness of our flat cable is mere 1.6mm as compared to the standard 5.8mm making them great for running under carpets, up walls, behind furniture, or anywhere that space is at a premium. The flat style cables are easier to manage, much harder to tangle, and offer an attractive alternative to standard cables. InstallerParts flat Cat6 patch cables are available in 15 different lengths ranging from 0.5 foot to 45 feet and come with molded strain relief boots. This cable provides exceptional transmission performance and is suitable for Fast Ethernet, Gigabit Ethernet / 10-Gigabit Ethernet. All InstallerParts Cat6 cables are made of 100% bare copper wire as opposed to copper clad aluminum (CCA) wire, therefore fully compliant with UL Code 444, which requires pure bare copper wire in communications cables. Our Cat6 patch and bulk cables are used by data centers around the world. FLAT CAT6 CABLE (10 PACK) : InstallerParts flat CAT6 patch cables are ultra flexible, attractive and space saving. With a thickness of only 1.6MM, they're perfect under carpets, up walls, behind furniture, or anywhere where space is a premium. 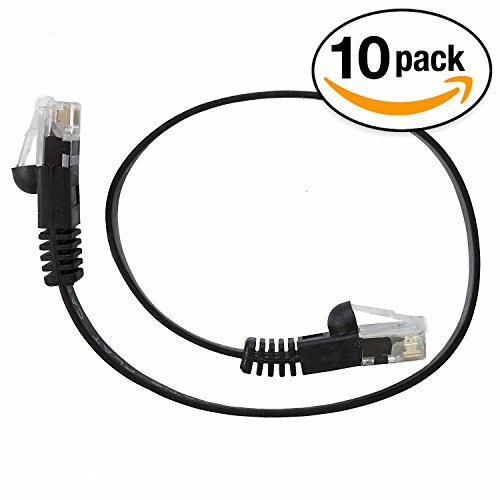 MAXIMUM COMPATIBILITY: Use our CAT6 patch cable to connect devices on a Local Area Network (LAN), such as laptops, PCs and Mac, computer servers, printers, modems, routers, switch boxes and more. TIA/EIA* T-568B standard wiring. UL/cUL Listed. RoHS. 100% MONEY BACK GUARANTEE: We are confident that you will love our CAT6 cables. If for any reason you do not, we will accept your return for a full refund.